I'm currently working for Sensics, helping develop the Unity plugin for the OSVR project. This will involve ongoing optimizations to try to reduce latency as much as possible. I'll be doing my research and reporting my findings as important changes and new developments are made. Starflocks is an 8 player multiplayer game where each gaming controller is shared by two people. Therefore, each player controls a joystick, which controls a fish. The goal is to stay in a school (or flock) as you descend into deep waters in order to reach a safe depth for your species. Staying close to one or more other fish will give you a speed boost that will help you avoid being eaten and find food faster, so work together. Food is a shared resource. You must find food or starve. It's really hard to beat this game, largely because it's hard to play due to the 8 player requirement :) Have fun! I wrote a short postmortem detailing my experience developing Hellicott City. Check it out here. This October I set out to develop my first virtual reality experience. A local art shop was hosting an “unusual” art show on the eve Halloween. A great opportunity to introduce VR to people who have yet to try it. Don’t induce motion sickness. Aim for 60-75 FPS. Learn the basics — wrap my brain around VR development/workflow. What do I have to consider and do differently than in a non-VR game? I will follow up shortly with a postmortem on how I approached this project and what went right and wrong… but I wanted to share the build ASAP because it’s Halloween! If you have an Oculus Rift DK2, check it out! I have started a new chapter in my life and career. I quit my full-time job in order to focus on Virtual Reality and its applications. VR is an amazing, powerful technology the likes of which the world has never seen before. It's a great time to be a game developer. I'm very excited to get started on creating content. Stay tuned. Battle Prism was on display at the App Arcade -- part of Baltimore Innovation Week's Closing Party. The new build with the new controls were tried out for the first time with mixed results. The barrier to entry is a little bit higher, but ultimately the game is more strategic. The color switching mechanic that once led to button mashing is now about precision and meaningful intent. Play is better. Halfway through the event, I hooked up my Oculus Rift DK2 to let people have a go in VR. The rest of the night was a blast, seeing people experience a VR roller coaster for the first time is a lot of fun. Some people are very susceptible and move their bodies and scream. Others remain perfectly still. Everybody comes away amazed and excited about the future of VR and its applications. B -- Change color. Always changes to the "safe" color. The "safe" color is the only color you can change to that won't get you stuck in the background. For example, if your character is red and standing against a blue background, you'll change to green. If you're blue and standing in front of green, the safe color is red. If you are standing against a black background, B cycles forward in the cycle R -> G -> B. B -- Change to Red. If red is "unsafe" (see above), the color change is not allowed. X -- Change to Blue. If blue is "unsafe", the color change is not allowed. Y -- Change to Green. If green is "unsafe", the color change is not allowed. 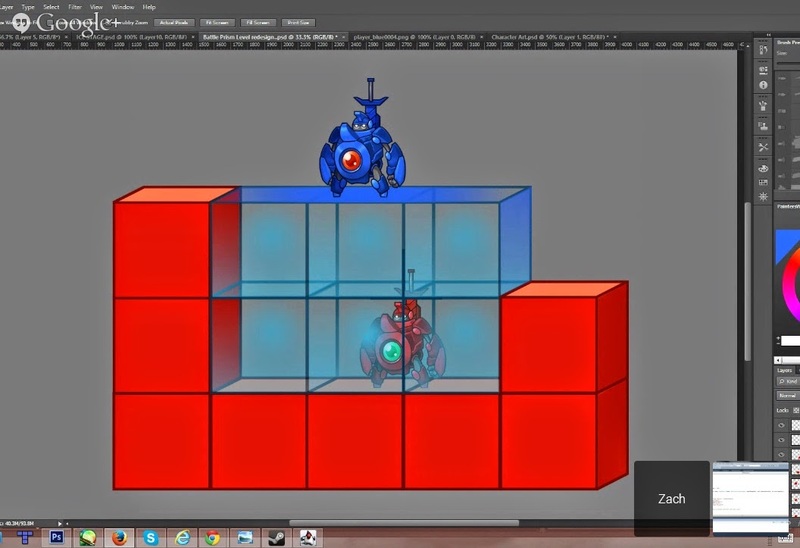 The core mechanic of Battle Prism is changing colors to navigate the environment. This action should be direct and intentional. We think a 1-1 button-color mapping will remove any confusion about what color you will switch to, allowing players to better utilize the mechanic in their strategy. working on the game, I can't play it. This is was the third or fourth time I've actually played the game. It was fun :) Thanks to everyone who stopped by! Check out this Gamescape Spotlight on Battle Prism! Gamescape is two days away. Doing some serious crunching this week to get Battle Prism ready for its first public demo. Come play! The game jam has concluded and I finally wrote up a postmortem reflecting back on the month of development. TLDR; time constraints were cruel and the final product did not quite get where I wanted it to be. A little polish would go a long way, and I'll probably revisit this project again soon. Overall, this was a fun experience and I got a lot of ideas out of it. There are no failures, only progress. Halfway through the Play the Music Jam: Summer Dogs. Battle Prism was accepted to Gamescape, part of this summer's Artscape Festival in Baltimore. I've rewritten most of the code from the game jam, figured out our level editing workflow, integrated new character animations made with Spine, and improved the player controls since the last update. If I'm stuck on something or have a creative block, I work on the player's movement and gravity until it feels exactly right. After a few months, it's starting to feel good. I'll get a demo up soon. There are some big visual updates coming that artist Zach Urtes (@cybertoaster) and I think will help fix the major gameplay/visual issues that have plagued the game since its inception. It might involve another dimension. Big congrats to Zach for a successful Echoes of Eridu Kickstarter! @JonSchubbe's amazing cubes will also be at Gamescape. He's making a ton of progress getting the illusions to pop and animations to project perfectly onto cube faces. Honestly, I think Jon could show this now at Artscape and it would be a very impressive installation/tech demo. 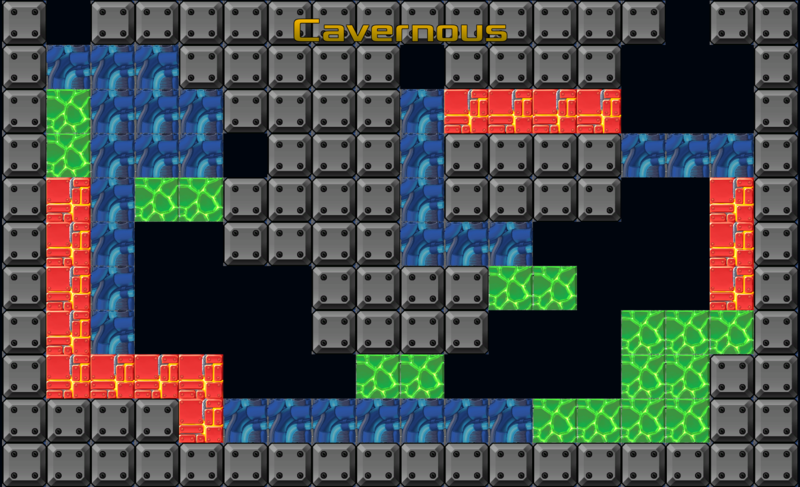 The plan is to make it a multiplayer game (one that's much better than our initial "Simon" demo below). It's fun to work in this design space and I can't hardly wait to write some code that can make this happen. We've got a ton of ideas, but we're still figuring out exactly what's doable by working out the technicalities of player input and managing communication between a plethora of technologies (Unity, Madmapper, Arduino, Syphon, MIDI Controller...). Given our current state of work, school, and life, this project will see more updates come later in the month, and kick it up a notch in June and July. I promise I'll document the trials and tribulations of all this stuff when I have some time. I'll leave you with some of Jon's latest work because it's awesome. Bmore Indie Games is running a month-long music-themed game jam. There is a kickoff meeting this Saturday at UMBC. Music Video Games are an intriguing, relatively unexplored genre. Looking forward to seeing what creations people come up with! 1) A spring game jam is tentatively slated for the month of May. It will be music themed. More details to come. 2) A new meetup location is in the rotation thanks to the kind folks at the Baltimore Robotics Center. It's a really nice space to gather and work. Cool toys, too. 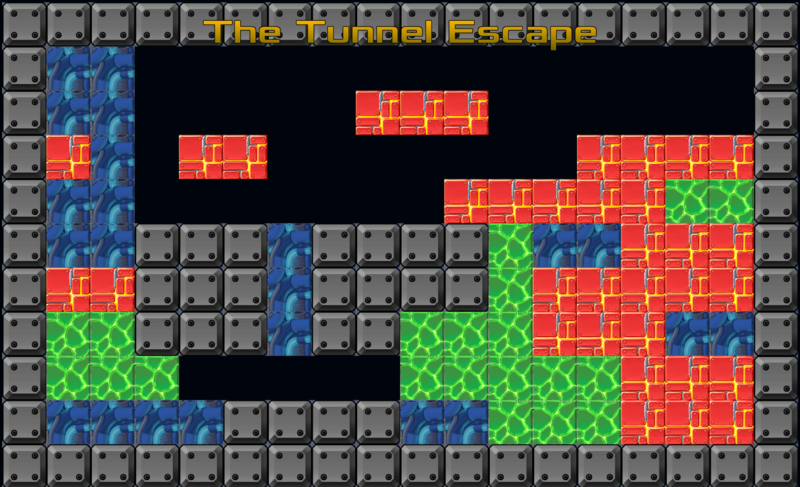 3) Gamescape 2014 has been announced. It has moved from MICA to a much larger space: the Carrot Theater on Charles Street. It will be bigger and better than ever. I've been very busy this past month with work-work, so no visual updates on my many side projects. 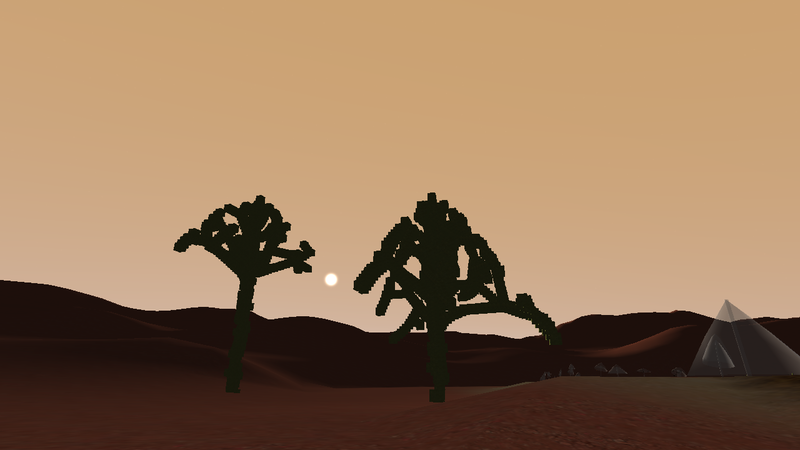 I'm in a research phase, learning as much as I can about procedural modeling, L-systems, fractal geometry, botany, and ecological succession before jumping back into the code for a tree/plant generator. 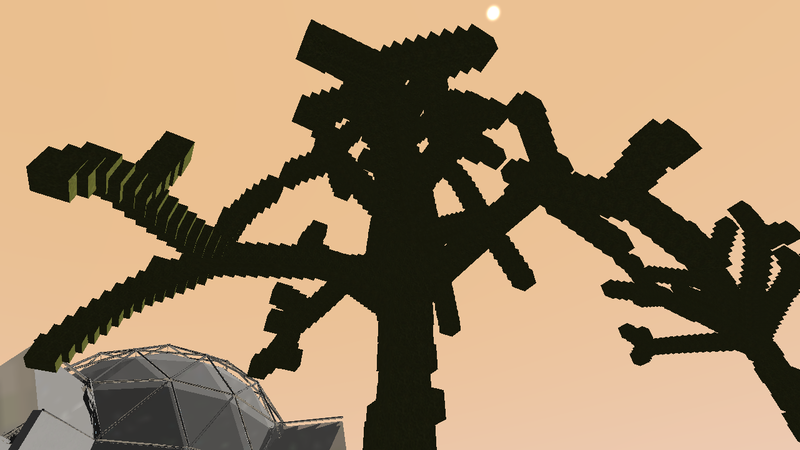 I wanted to share an early version of the Tree Generator I'm working on. It's a very rough but working implementation of the Space Colonization algorithm, which models tree growth by populating a volume with "attraction points", then iteratively growing the tree toward the closest attraction points. It was fun to get it working, but I've since moved on to other models as I am looking for a more realistic approach to modeling a tree's growth from seedling to adult. We've changed the working title of Prism Break to Battle Prism. There have been a ton of additions. See the complete list of added features and download the latest version of the game here! While not aesthetically pleasing, these Polygonus Opuntiaceae are able to survive even in harsh, dry, cold environments. Our team, and others from last month's Global Game Jam, will be speaking about what went right, what went wrong, and how the game has changed since the GGJ. Then all the games will be set up to play. Prism Break is in dire need of heavy playtesting. What a weekend. The theme this year was "We don't see things the way they are, we see them the way we are". The UMBC site finished with a plethora of amazingly high quality games for 48 hours. See them all here. I programmed a game called Prism Break. 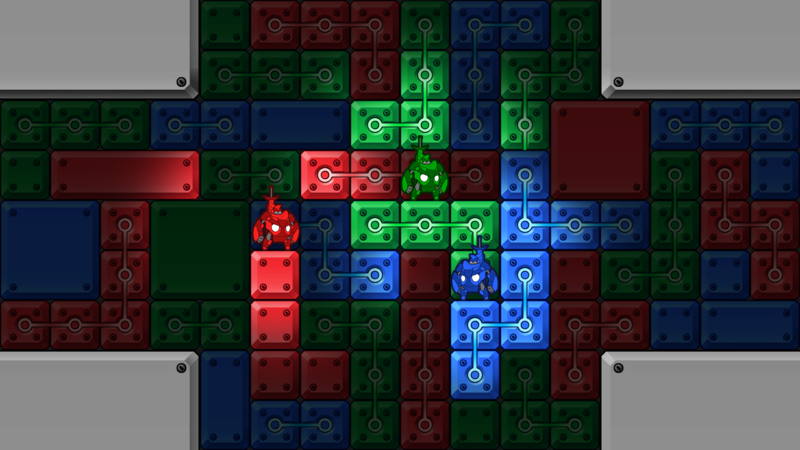 It's a tri-color multiplayer battle arena game where players are able to cycle their color between red, green, and blue. 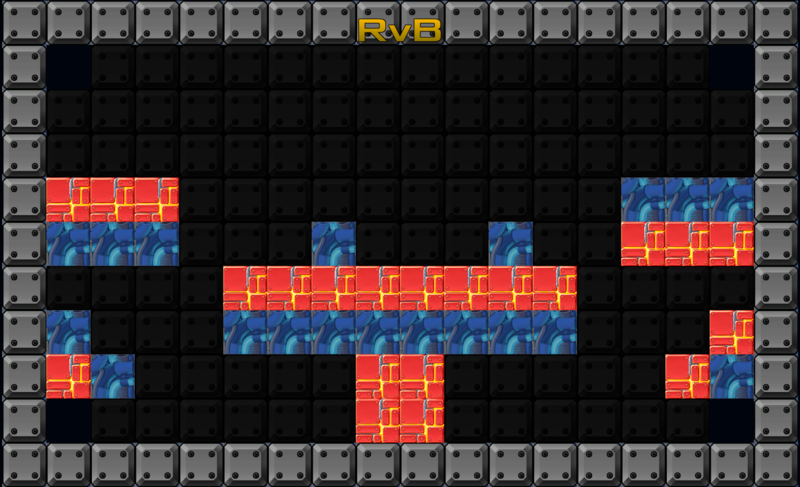 Players can only collide with tiles that are the same color. Players can only attack other players that are the same color. I'm really happy with how the game turned out. It's fun. Play Prism Break on the web. Download Prism Break for Windows (zip at bottom of the page). Both versions require two Xbox 360 controllers. It's that time of year again. The GGJ is tomorrow. I'll be tweeting with progress updates along the way. Very excite!